We can all agree, there’s nothing worse than flat, boring hair. When it comes to the ‘flat top’, however, this enduring classic is anything but dull. Born into the military world and made popular throughout the 1950’s, this angular style featured short hair on the sides and longer hair up above. This long hair was then sculpted upwards with a distinctively flat plane cut across the top. 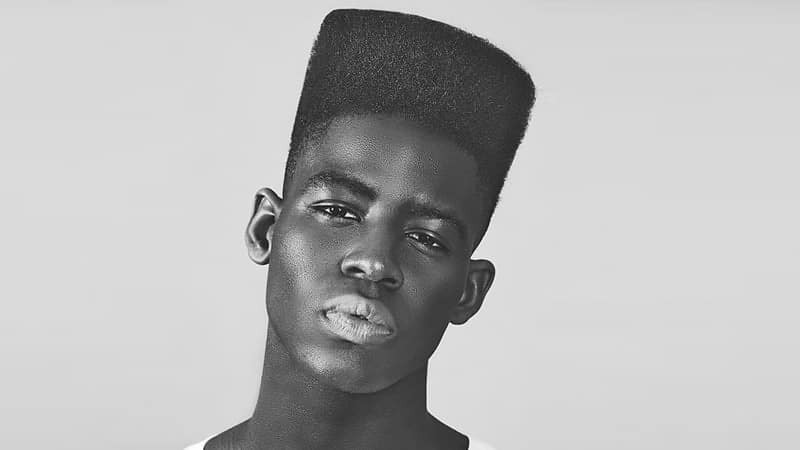 Ultimately, as times, culture and the world evolved, so too did the flat top. Rocker types embraced its rebellious, bold connotations, while the hip-hop fans of the 80s and early 90s took the trend sky high. 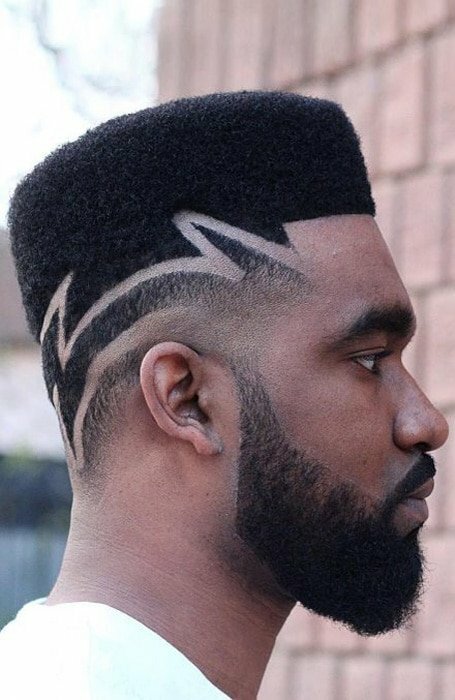 Therefore, if you’re seeking a crisp, soldiers cut or are looking to channel the Fresh Prince of Bel-Air, its time to give this look a try. To set you on the path to styling success, we’re here to reveal the best flat top haircuts for men. Take the flat top back to where it all began with an angular, military style. 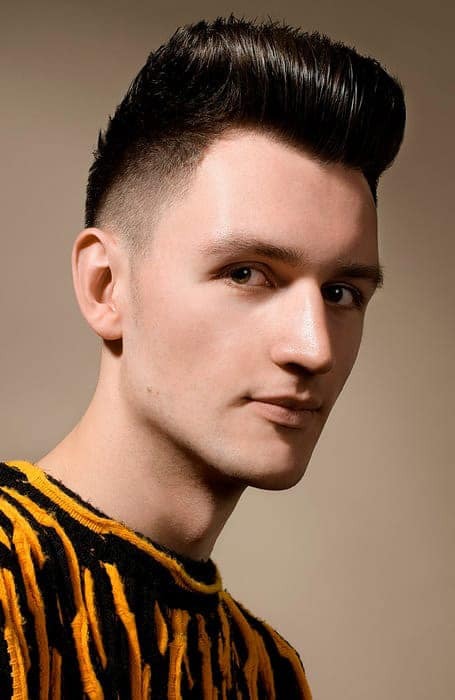 This masculine look is created by pairing a closely shorn high skin fade with a cropped flat top. The result? 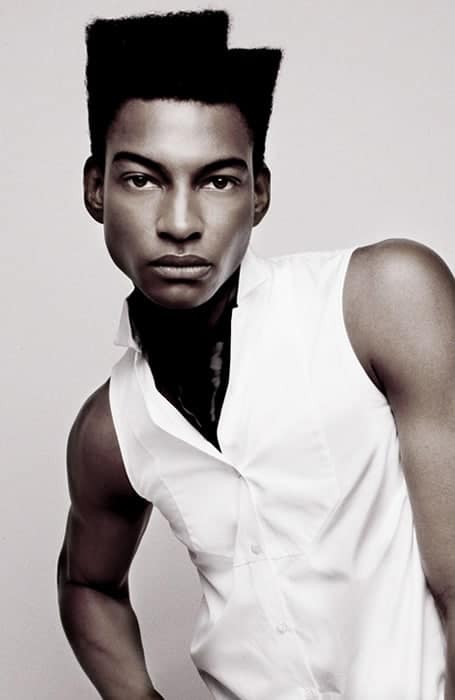 A simple, sharp and commanding cut that will emphasize strong jawlines and chiselled cheekbones. Although it may seem counterintuitive to have a flat top and dreads forming the one head of hair, throw out the old rules, because this is one look you’re going to want to try. As striking as it is effortlessly cool, flat top dreads are an instant way to gain major street style points. 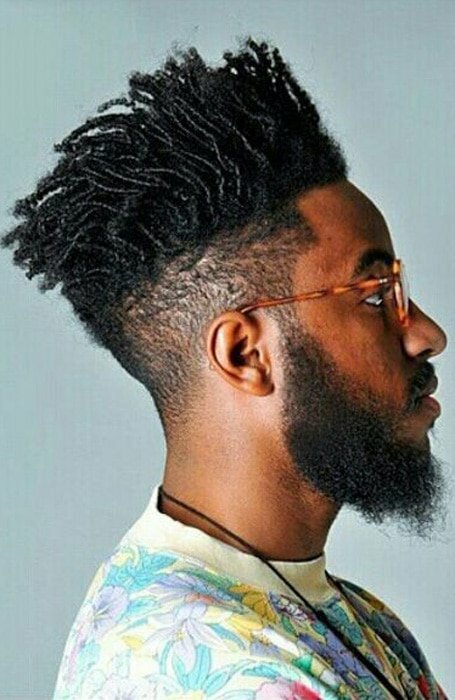 To create this look, you will need to meticulously cut and sculpt your dreads upwards into a cube-like form. While the inevitable texture may not allow the top to be as flat as some other variations, it is the overall shape that is the focus of this bold look. 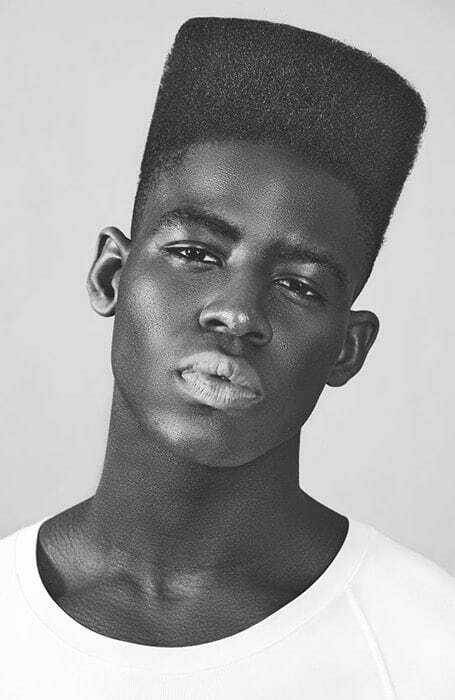 When it comes to the flat top, it isn’t just straight-haired men who can enjoy the trend. 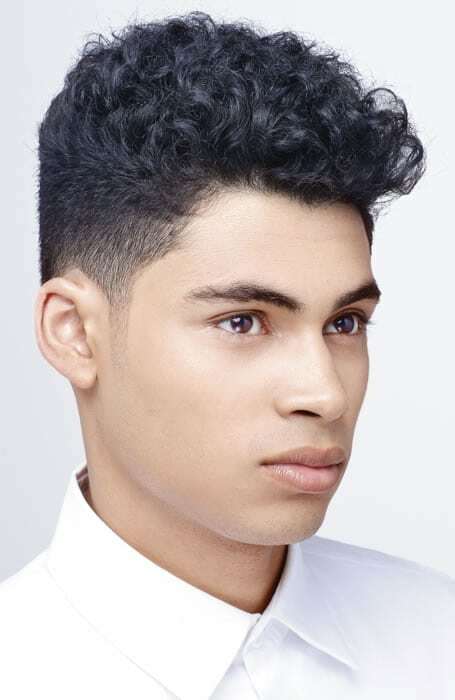 If you’re currently sporting charming, mysterious curls, keep cool during summer by structuring these into a well-sculpted flat top. Ultimately, however, this fresh, modern look isn’t a favourite merely for its warm weather practicality and is a winner all year round. Beauty lies in the details, and when it comes to the flat top, it always pays off to add something a little extra. 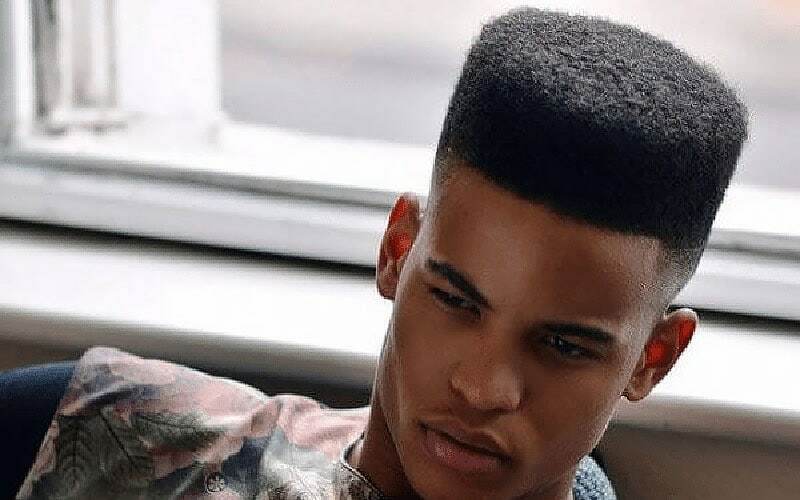 Whether you incorporate a modern, expertly cut fade, add in some funky ‘steps’ or rework those dreads, there is a vast range of ways to make the flat top style your own. One of our favourite ways to do just this is the addition of some line designs. If your barber sees himself as an undiscovered artist, then you’re in luck. Take a leap of faith next time you’re in the chair and request to have unique, geometric lines shaved into your fade. This is an instant way to add a touch of individuality to the classic flat top. 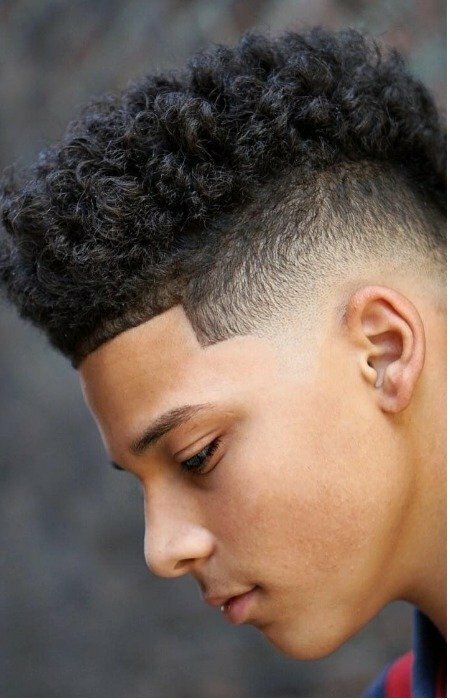 A simple and effective way to freshen up a flat top is to really emphasize its height and shape with a fade. By keeping the hair extra short and tight along the sides and back of the head, this will draw all eyes up to the pièce de résistance of your haircut. Consequently, we recommend a high skin fade to create this strong juxtaposition. A flat top is undoubtedly an instant way to bring a cool, street style vibe to your curls. To take this one step further, and really gain those style points, we recommend adding a high fade into the mix. This will emphasize the texture, height and sculptural appeal of your curly flat top, to complete this magnetic, on-trend look. 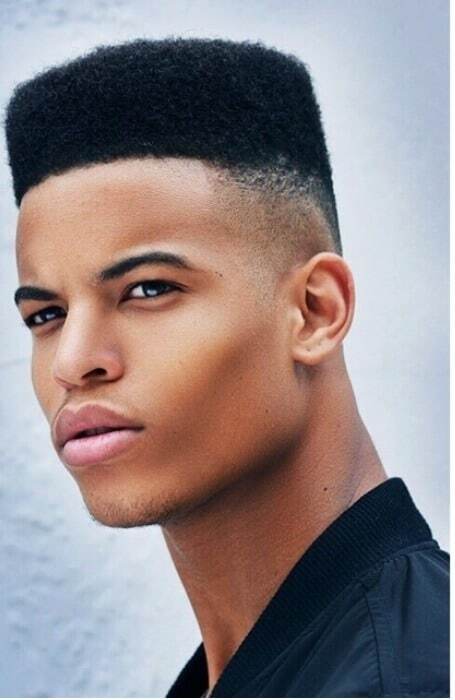 Ensure to keep your barber on speed dial for fortnightly fade and flat top trims. Straight up and down, this bold look is destined to capture onlooker’s attention. 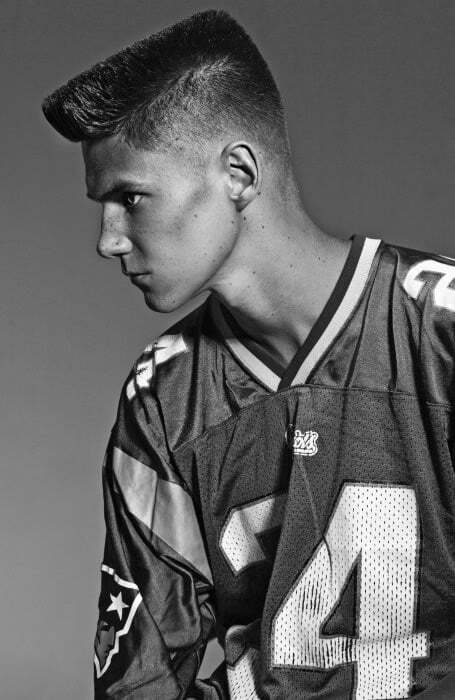 If you’re looking to give limp locks some added definition and height, then a flat top haircut is the way to do so. The natural texture and movement of straight hair allow it to be easily styled upwards with a dryer, comb, and some strong product to lock it in place. However, your perfectly vertical straight hair strands will also make it obvious when the hair has grown out. As a result, it is important to make a trip to the barber, or a date with your clippers, a regular event. Keep things short, sharp and stylish with a flat top buzz cut. 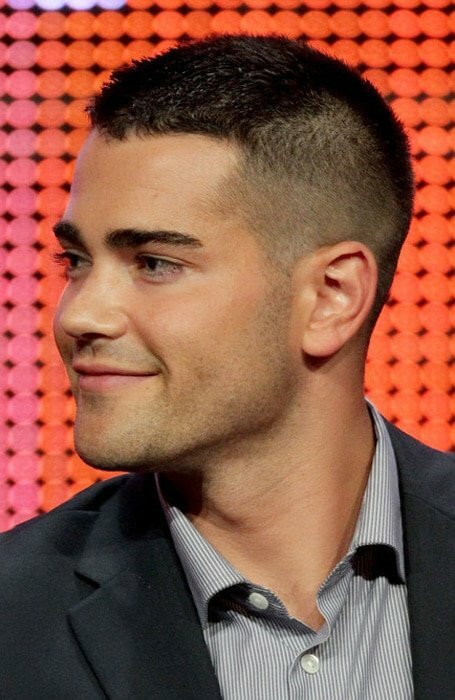 Similar to the military and short flat top, this style crops the upper hair even closer towards the scalp, while maintaining the signature flat, square shape. As a result, this sporty, masculine look is a great go-to when growing out a shaved head. Similarly, if you’re going the opposite way and looking to shave off your locks, a flat top buzz cut allows you to test the shorter hair waters before committing to the chop. Reinterpreting the classic fade, the burst fade provides a unique element to any flat top haircut. 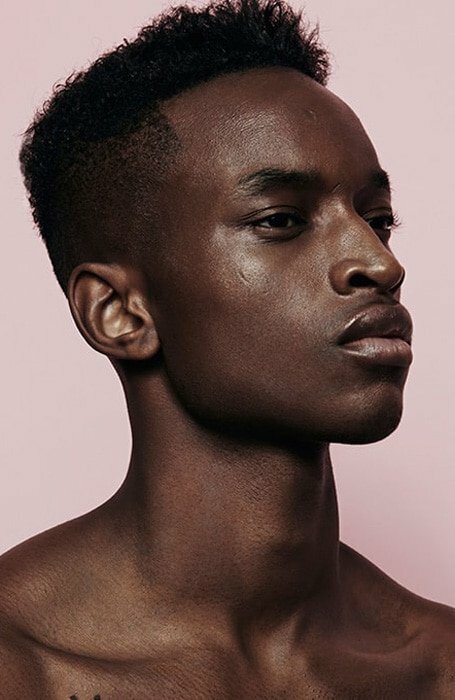 The standout feature of this fade is the way that it curves down around the ears towards the back of the head, where the hair is left to grow long. 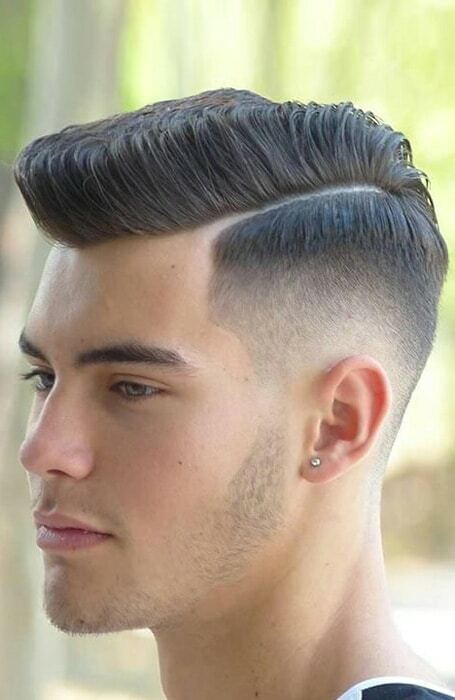 Consequently, this style allows you to create a sharp flat top across the top of your hair, before allowing the hair to drop down into a polished plane towards the nape of the neck. Much like its other flat top variations, this style requires regular grooming attention to keep you looking sharp. Take things up a notch by turning your hair into a sculptural work of art. The flat, angular planes which are signature to the flat top hairstyle seamlessly allow for the creation of ‘steps’ in the hair. Essentially, this creative technique involves barbering wizardry and a whole lot of personal confidence. The ‘step’ look requires creating one flat top plane, before cutting this sharply down at a 90-degree angle, which then meets another 90-degree flat plane. From there, the number of steps you incorporate into your new do is up to you. Add a touch of sophistication to your flat top with a polished side part this season. 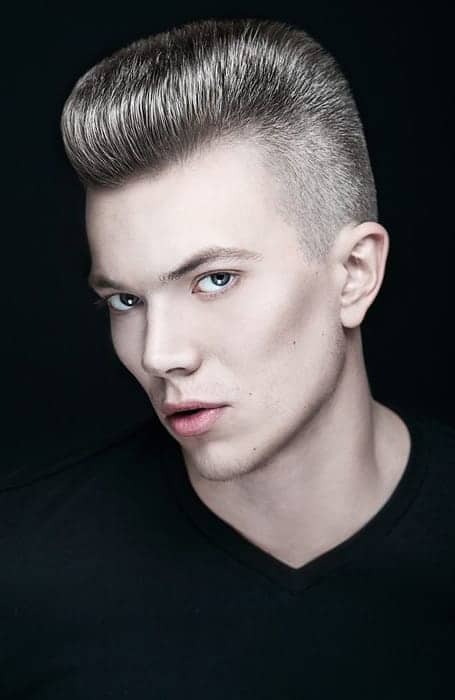 To create this look, cut a high fade that reaches fullness as it meets a defined line side parting. On the other side of this line will be your statement-making flat top. The separation brings a sleek, corporate feel to the sometimes sporty, often street-style flat top. As a result, it demonstrates the versatility of this classic style. Revive the golden era of hip-hop this season with a funky, towering high top. In flat top city, this one is the skyscraper, so walk tall with this confident cut. To ensure that this look remains in place from dawn till dusk, regular grooming and some serious styling products will be required. Thick, textured hair will also be naturally more easy to sculpt as it grows longer. As a result, this look is ultimately best suited to thick haired men. For an electrifying new look, inject some high-voltage blue into your haircare routine. 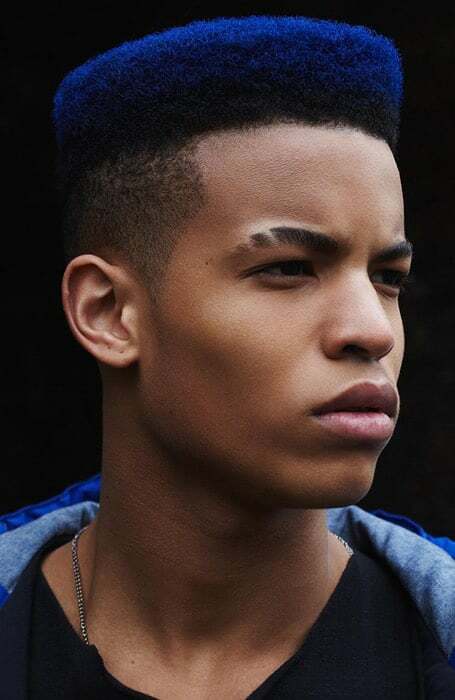 A splash of dashing blue will instantly bring your flat top cut into the 21st century and beyond, creating an eye-catching, modern expression of individuality. Perfectly paired, the clean, sharp cut of the flat top balances the out-there, bold aesthetic of the blue. From glacial light blue to a darker, electric hue, push the boundaries and experiment with various shades of this popping colour. From the youth culture of the 60s to the rebellious rockabilly, the flat top boogie has been a cult favourite that has endured. Also known as a ‘flat top with fenders’, this slick style replicates the idea of a burst fade, with the fade curving down over the ear towards the back of the head. The hair at the nape of the neck is not shaved into a fade, but, rather, cut short to blend upwards until it meets the flat top. Along the sides, that fade we mentioned earlier is left just long enough to be brushed and blown towards the back of the head. Sound complex? This tricky, yet highly stylish look will require a skilled, patient barber and some dedicated maintenance. However, its lasting popularity proves that its worth the time. If you’re not about that hair gel life, a short flat top will allow you to take part in this enduring trend, without spending your savings on styling products. 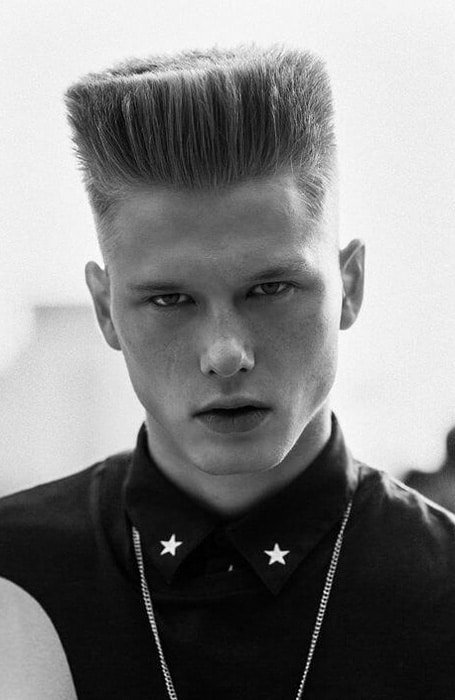 Easy to maintain, this look mimics the typical features of the flat top, but simply keeps the hair shorter up top. For this reason, it is very similar to the classic military flat top. The defining feature of a military fade is the addition of a high skin fade to the short flat top. The short flat top, on the other hand, allows for the same practicality and clean cut while leaving the fade style up to you. For any man who has tried to cut their hair before, you would be aware that it’s not as easy as it looks. Consequently, achieving anything other than a bowl cut or a general trim requires time, skill and forgiving friends to practice on. Similarly, the flat top is one style where looks can be deceiving. In other words, unless you’ve mastered the art of the clippers, do not try this at home. Rather, to create and maintain this look, we recommend making regular trips to the barber. Generally, after the initial shaping, a touch up every fortnight will ensure your crisp cut remains sharp and on trend. Day to day, this look can be styled by combing the hair upwards and fixing it in place with gel, wax or spray. As a general rule, the bigger the hair up top, the bigger the gel, wax, or spray bottle you should be buying.